Apple cider vinegar cleaning is a wonderful, natural way to clean grease and grime around the house. 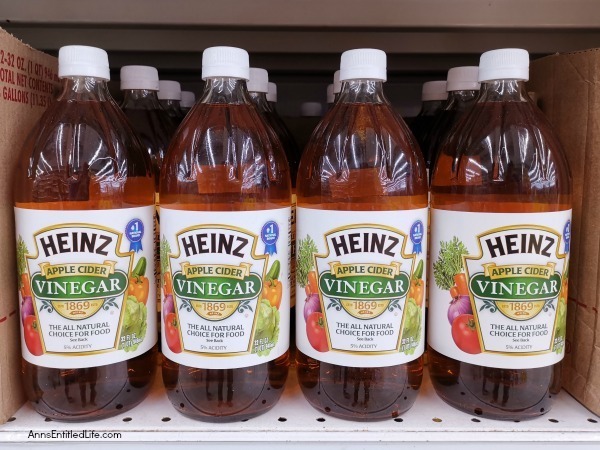 If you are not certain of the best uses for apple cider vinegar when cleaning, I have a handy list of tips and tricks you can use which will help leave your house sparkling clean and smelling great. Many people do not care for compound chemicals in their everyday cleaners. Some people think that harsher chemicals like bleach and ammonia may have a negative effect on their health over time, and prefer not to use cleaners with possible side effects. Added to that, many of the cleaning products we use in our home are only good for a few items and we find ourselves using many different cleaning products in the house. How many people have a bucket full of different store bought cleaners – each for a specific use? If you would like to go a little greener with your products while also using a product that can replace many of the things you are using in your home, consider apple cider vinegar. Not only is it cost effective and safe to use (note: never use vinegar on marble… it can cause damage over time… ask me how I know), but you can also use apple cider vinegar for a TON of different things. There are hundreds of uses for apple cider vinegar, but to give you an idea of what is possible, here are ten ways you can use apple cider vinegar around the house! 1. Cooking in the kitchen can leave our surfaces greasy and sticky. Use apple cider vinegar as a degreaser to get the gunk off of your countertops, stove, and cabinets. 3. Our houses can sometimes have nasty odors, and sprays can contain manmade chemicals. Diffusers can help to create a pleasant smell, but they are often not great for quick odor removal. When you smell an ugly odor, get it gone quickly by placing a bowl of apple cider vinegar in the room with the smell. The apple cider vinegar will work to make that stench a distant memory. 5. Weed killer can be an extremely toxic substance to use, especially in your kitchen garden with items you intend to eat. Instead of using poison, try to spray weeds down with apple cider vinegar. It will kill those weeds, and keep your garden toxin free. 6. Training young pets, or caring for old ones can take its toll on your carpets, leaving them a touch smelly and stained. Get your apple cider vinegar, and go to work on those stains. The use of apple cider vinegar with a touch of baking soda will neutralize those odors and give you a nice clean carpet again. 8. Fruits and vegetables can come coated in dirt and pesticide. Instead of investing in expensive vegetable washes, make your own using apple cider vinegar and water. Your veggies will be fresh, clean, and ready to eat. 9. Get ready to grab your newspaper and your elbow grease. Clean your windows like grandma used to do with apple cider vinegar and old newspapers. Ok, you can skip the newspaper and use modern paper towels. Mix half vinegar and half water into a spray bottle and go! 10. A wonderful multi-purpose spray is everyone’s favorite. You can grab, spray, wipe, and move on. Apple cider vinegar will be able to do this job for you. Mix a mixture of half water and half apple cider vinegar to start disinfecting everything a spray can reach. Apple cider vinegar is an amazing product. With it, you can clean, disinfect, deodorize, and even make a great salad when you are done tidying up the place. Using apple cider vinegar in your home can help reduce the number of store-bought cleaning products in your house without sacrificing cleaning power. 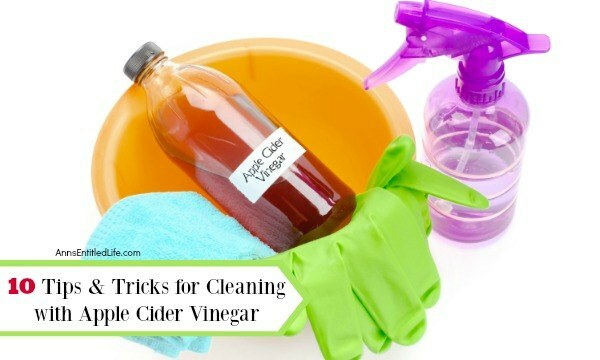 What do you use apple cider vinegar to clean in your home!? Note: None of this is meant as medical advice. I am not a doctor, and do not play one on the internet. Please consult a physician if you have any questions about using apple cider vinegar so your doctor can better explain to you the benefits, possible side effects, and any warnings about apple cider vinegar. • How To Care For Wood Furniture – Simple and easy step-by-step instructions on how to care for your wood furniture so it might last a lifetime! These expert tips will help keep your wood furniture looking beautiful. 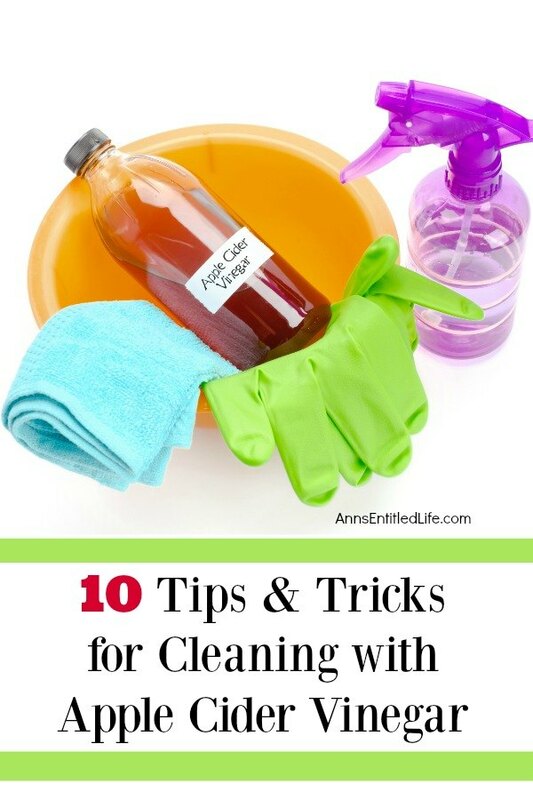 • 15 DIY Cleaning Formulas to Make and Use at Home – Homemade cleaning formulas are some of the easiest “recipes” you will ever make! Many DIY cleaning formulas work as well, or better than, commercially made cleaning products. Here are some homemade cleaning products for the kitchen, bath – the entire home! • For more Library Reading posts on Ann’s Entitled Life, click here. 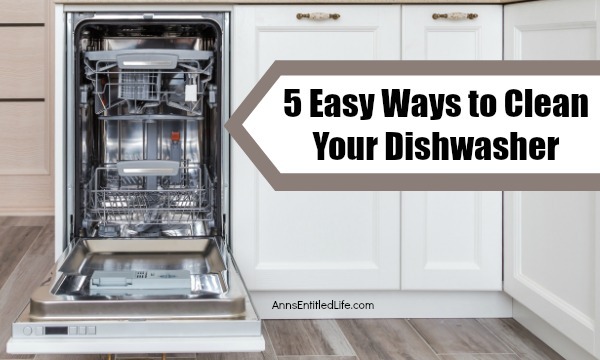 • For more Household Tips posts on Ann’s Entitled Life, click here. Front load washing machines are a great way to get your clothes clean, while also saving energy and water. But one major problem many high-efficiency washer owners find is that they can quickly start to smell if not properly maintained. Luckily, there are a few simple measures you can take to avoid those nasty smells and ensure your clothes stay fresh and clean every time you wash. 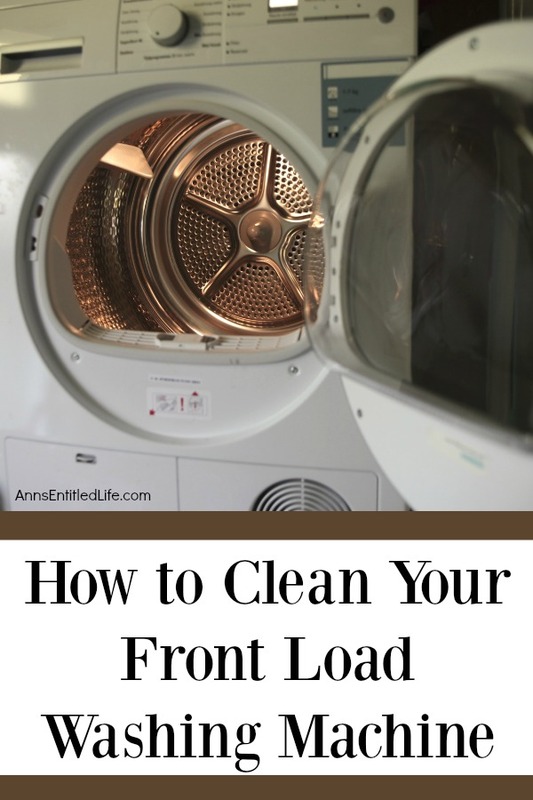 Learn how to clean your front load washing machine and keep it fresh and sweet smelling! Before we dive into how to keep your front-loading washing machine clean, let’s talk a little bit about why they stink in the first place. 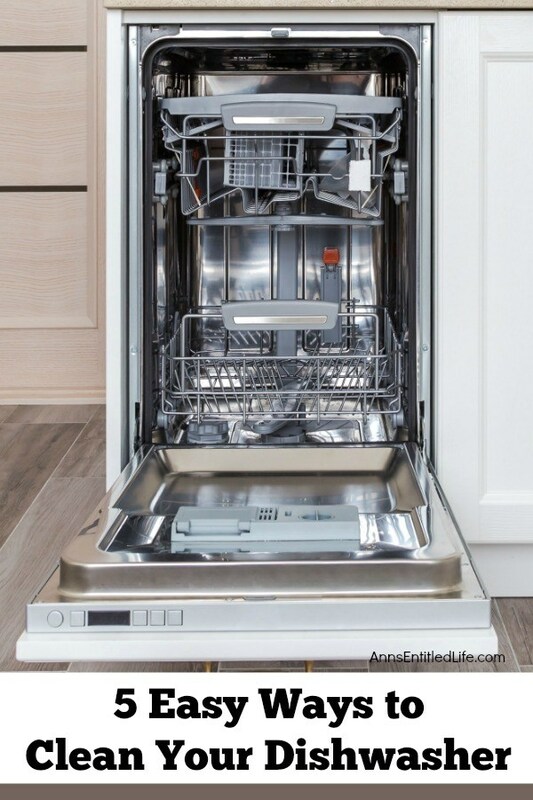 High-efficiency washers use less water and energy than standard washers, which is great for your utility bills, but not so great for the cleanliness inside the machine. Less water means that there is a bigger opportunity for detergent resident, mildew, and hard water deposits to build up inside the machine. That buildup can result in foul smells inside the washer. And those nasty scents can be transferred to your clothing as you wash if you are not careful. To keep your washing machine for getting gross, follow these simple steps. This process will help ensure each part of your washer is sparkling clean, so you never have to get a whiff of mold and mildew inside your washing machine again. Read your washing machine manual before you do any of the listed ideas below. My old Miele washer and my current Asko washer have a “do not use bleach” caveat, and so I never use bleach when laundering or to clean the washer (the water was almost boiling, so things get killed and cleaned very well). Other washing machines may have different cleaning warnings. So, before you begin, read the manual! Also, my Asko actually has a “drum cleaning” setting. If your washer does, that may be enough for you! The first step to properly cleaning your front load washing machine is the probably the easiest – run a wash cycle with vinegar. Vinegar is a “natural disinfectant”, making it a great option for cleaning your front-loading washing machine. It will also help deodorize your washer, working to remove some of the foul smells coming from inside the washing machine’s drum. Start by making sure the inside of your machine is completely empty. Then add two cups of vinegar to the detergent tray and select your washer’s clean cycle or tub clean setting. If your washer does not have a cleaning cycle, you can also select the hottest setting for the largest load. Allow your washing machine to run through the cycle completely (both wash and rinse). After you have finished washing with vinegar run another quick rinse cycle to ensure that all the residue and any lingering vinegar is washed away from inside your washing machine’s drum. Note: I know a lot of people that use vinegar in the rinse cycle instead of fabric softener. I do it myself fairly often for towels if they are not being bleached. While vinegar is great for disinfecting and deodorizing, tough odors and mildew inside your washing machine will probably need a stronger disinfectant to do the job. Bleach is the perfect option for cleaning your washing machine of hidden mold and mildew. By using bleach in the tray of your washing machine, you are not only helping to disinfect and deodorize the tray, but it will also help remove stains and germs in your washing machine’s drum, as well. To wash your washer with bleach, add two cups of bleach to the machine’s detergent tray (note: do not overload. If your tray cannot take that much bleach (mine cannot), use the maximum recommended amount). Then run your washing machine on the clean cycle (or hottest and largest setting if your machine doesn’t have a clean cycle). Be sure to allow your washer to run through a complete cycle with a completely empty wash tub. After you have finished both the wash cycle with bleach, run another quick rinse cycle to ensure that all the residue and any lingering bleach is washed away from inside your washing machine’s drum. The easiest way to “clean” the detergent tray is to not allow for soap, fabric softener, or non-fabric bleach build-up. Clean as you go. To keep smells at bay, not only should you leave your washer door open in between cycles, but you should keep your tray open. Ever notice some water left behind? If you open your tray, that will evaporate – instead of breeding smells in a closed tray! The detergent tray of your front load washing machine has a lot of different liquids running through it every time you run your washer, which means it can be a place for mold and mildew to hide. A great way to ensure your detergent tray stays fresh and mildew-free is to clean inside it and all its components on a regular basis. Start by removing the bleach dispenser, detergent dispenser, and fabric softener dispenser trays and soak them in warm, soapy water for a few minutes. While your trays are soaking, use a damp washcloth or sponge to wipe down the inside of your detergent tray. Be sure to reach into the back of the tray to wipe away any mold or mildew you cannot easily see. Finish by washing each of the trays, drying them and placing them back into the detergent tray. The door and door seal of your front-loading washing machine can get dirty very quickly, so it is important to take the time to clean it as often as possible. Start by creating a bleach solution by pouring one cup of liquid bleach into one gallon of warm water. Use a clean, lint-free cloth to wipe down the glass part of the door with your bleach solution. The next step to cleaning your washing machine’s door is probably the most important – the rubber seal. This seal helps keep water from leaking out of your machine during the wash and rinse cycles, which is an important job, but it can also be a place where mold and mildew can hide if you do not keep it clean. To keep your door’s seal fresh, pull it back (but do not dislodge it) and wipe the gunk inside with your bleach solution. Then, take another dry cloth to the seal and wipe again to remove additional moisture from inside and avoid more mildew or mold from growing in the space. Your washing machine’s gasket is the most likely place mold and mildew are hiding inside your front load washing machine. The gasket is the rubber section located between the door and the washer’s drum. And I bet it will be the grossest part of the machine you will clean – you probably have no idea how dirty it even is! To see the grime inside your washer’s gasket, pull back the rubber seal (but do not dislodge it) and take a peek inside the deep crevice between the gasket and the drum. To clean this yucky part of your front load washing machine, dip a lint-free cleaning cloth into your bleach solution and wipe all around the inside of the seal. Make sure you really soak the space with bleach to help the cleaning solution do its job. Let the bleach soak into the area for five to 10 minutes by leaving the door to your washing machine open. This will give the solution a chance to kill mold and mildew inside the gasket and let the water soak into any stuck-on grime. Then, use a dry cloth to wipe away the cleaning solution and residue that it loosened during the soak. While the interior of your front load washing machine is probably the source of any foul odors coming from your washer, it is always a good idea to keep the exterior of your appliance clean as well. To clean the exterior of your washing machine, spray a cleaning solution along the top, front, and sides of your machine and wipe away any dust or detergent resident with a damp cloth or sponge. Finish by spraying a glass cleaner on the window and wipe away with a lint-free cloth or paper towel. The final step to cleaning your front load washing machine is to allow the appliance to air dry completely before using it. 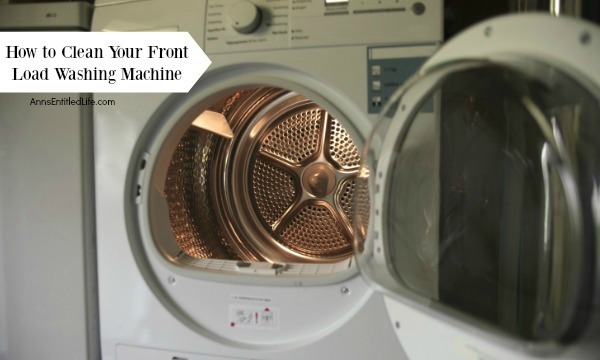 Simply leave the machine’s door open for a few hours or overnight to give the machine time to dry completely before you wash another load inside your clean washing machine. In fact, is a good idea to keep your machine’s door open after each use to allow it to air dry after each cycle. This will help prevent mold and mildew from building up inside and make deep cleaning your machine easier next time! Note: None of this is meant as medical advice. I am not a doctor and do not play one on the internet. Please consult a physician if you have any questions about using bleach or vinegar so your doctor can better explain to you the benefits, possible side effects, and any warnings about bleach or vinegar.